You know it’s fall when the baking chips change! The first new flavor of the season is Reese’s Baking Cups and Reese’s Pieces Candies. 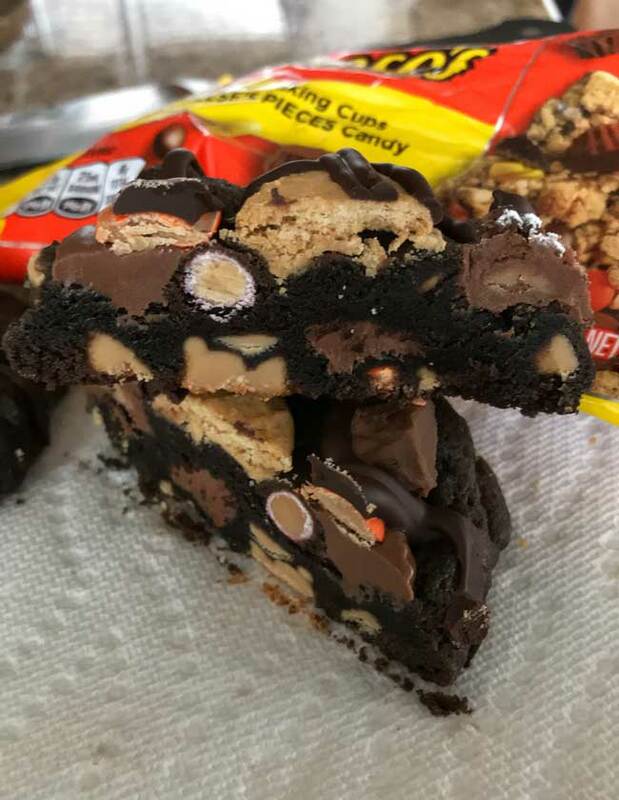 It’s just a mix of the two candies, but a very convenient product for those of us who like our double chocolate cookie cross-sections to look like this. I found the product at Jewel. 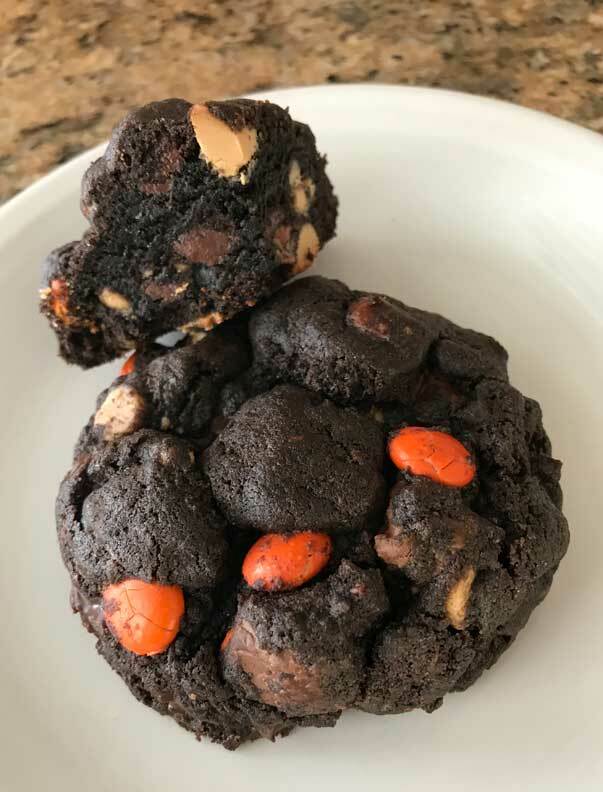 As for the cookies, this is one of my favorite double chocolate cookie recipes. 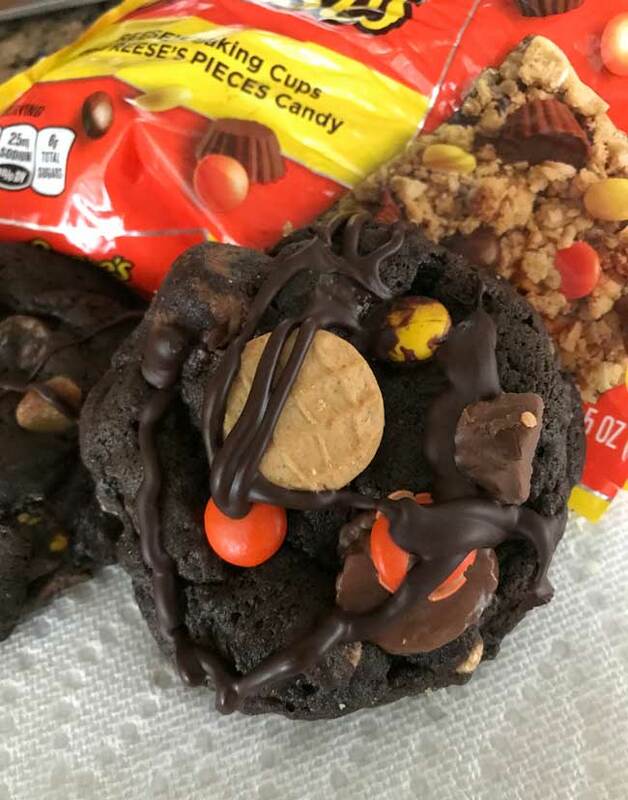 I usually pack these with Reese’s Peanut Butter Chips, but I think they look even better with a mix of the chips and the new Reese’s Baking Cups and Reese’s Pieces Candies. Mini Nutter Butters sold separately. Here’s the recipe (and one more photo). Put the butter in the bowl of a stand mixer and beat with a paddle until it becomes creamy. Add the sugars and beat for about 4 minutes, stopping occasionally to scrape sides of bowl. With mixer on low speed, pour in the 100 grams of beaten eggs and the vanilla. In a separate bowl mix together the flour, cocoa powder, baking soda, and salt. Add to the mixing bowl and stir on low until completely blended, then stir in the peanut butter chip mixture. Scoop dough into 12 equal size mounds and place on a piece of plastic wrap. Cover and chill, cover with plastic wrap and chill for several hours (I recommend overnight) or until the dough is stiff. Arrange oven rack so that it is in the top third of the oven. When ready to bake, arrange dough balls on a parchment lined baking sheet and bake at 375 F. for 16-18 minutes. Cookies should look slightly underdone. Allow cookies to cool on the baking sheet for about 5 minutes, then carefully transfer to a wire rack to finish cooling. Note: For this recipe it is best to weigh the flour. 2 cups of flour can be anywhere from 250 to 280 grams. I used 280 grams total. I mixed the dough together yesterday and baked two of these today. They are excellent cookies. The texture is perfect. Chocolate peanut butter fans will LOVE these! Mine look just like yours except I didn’t use any mini nutter butters. These really are good. I’ve been making them over and over and trying little changes such as substituting corn syrup for part of the sugar and experimenting with the ratio of egg white to yolk. I’ve also tried with bleached white flour, which I know people don’t like but which makes the cookies thicker and puffier. Bread flour also works, as does a combo of bread and AP so long as it equals 240 grams total. Chilling the portioned dough overnight also makes a huge difference. Also, if you can’t find the new Reese’s mix you can just buy the cups and Reese’s Pieces separately. Intense! I’m a Reese’s lover, so will have to try. My son-in-law would love these! He may get them at Christmas instead of peanut butter cups if I can find a bag of the chips/candy. Wow – those look amazing!! !